I don't know what possessed me to start the Holiday Hello tradition, but for five years now it's been an essential element of getting ready for Christmas. A collection of words and images, the editions of our Christmas newsletter capture the passing of the years in an incredible way. In 2006, when I started this caper, Heather had just begun her healing journey and we had spent a luxurious ten days in Italy. Ben was a little boy and Dylan was already growing into a little man. In 2007, Rhema joined our family from Taiwan, our Nanny for two years, and still a dear friend. This was the year of the Doré family reunion in Vernon and our house boating adventures in the Shuswap. I moved into the permanent role of Director of Marketing & Communications while Heather began to grow her yoga practice. 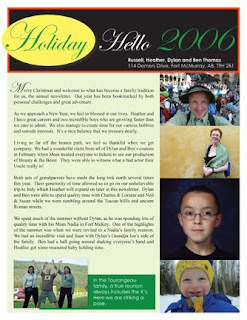 The Holiday Hello in 2008 told the story of our wonderful trip to Ontario and Dylan's first surgery adventure. Based on the pictures, this was the year I fell in love with fishing! I also appear to be rather paunch around the middle in the picture taken in front of the garage holding a nice walleye. I probably should have started the Middle Age Bulge blog around this time. 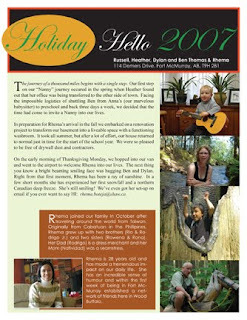 By 2009, baby Julia had entered our lives and Heather's Ananda Center for Balance had opened in our basement. I won the Best Actor award that year when Kenny and I performed The Zoo Story down at the provincials in Medicine Hat. Dylan became a huge fan of wrestling in this edition while Ben began his fascination with Club Penguin, Disney's virtual world for kids. 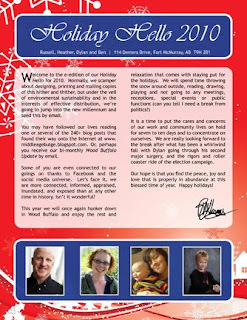 The 2010 edition of our Holiday Hello attempts to share bits and pieces of what has been an incredible year. An exciting election, Dylan's second surgery adventure, Heather's growing cadre of clients and students, Ben's emerging artistic talents all pepper into this year's story. There are also some striking photographic memories from our summer trips to Saskatchewan and British Columbia. As the months and years flow past the high water mark, it's amazing how much we forget. Moments and memories are fleeting, at best. This brief synopsis of our lives, camouflaged as a Christmas greeting, helps us remember and allows us to share the many blessings we've been given with friends and family near and far. Merry Christmas and all the very best wishes for a fantastic 2011!